I am all about a good theme party (people fly in from around the continent for my Oscar party) and even I am super impressed by this mock-wedding. 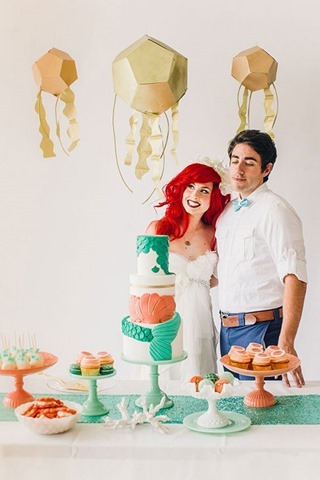 Traci Hines and Your Cloud Parade designed this Little Mermaid themed wedding to help give people the inspiration they may need for their own themed wedding. 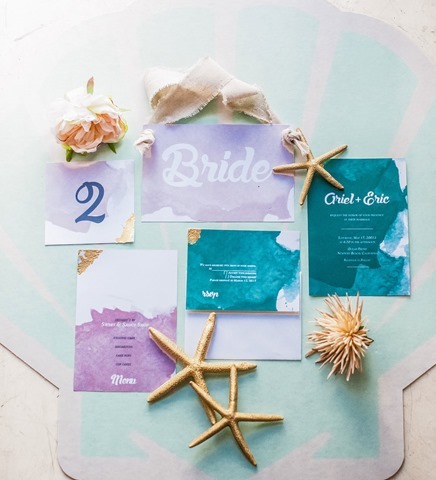 Disney Style Blog even gave them props on their “perfect mix of whimsy, color and a nod to our favorite mermaid.’ Many people are wanting to think outside the box for their weddings in today’s society and adding a theme is one way to go this route. Some people aren’t quite creative enough to come up with these ideas on their own and there is only so much Pinterest searching one can do. So, with that in mind, let’s take a look at how these talented artists created their Little Mermaid themed mock-wedding. We’ll start with the decor. Everything was in seashell motif from the dishes to the macaroons! The color scheme was coral, sea foam green and white for the table setting and it really looked like something straight out of a Florida condo, The cake even had a mermaid tail and scales! Jellyfish were hung from the ceiling above the table to give it that real ocean feel ( and also a little reminiscent of Finding Nemo). The invitations and stationary were done in water color which is quite fitting and appropriate. From the invitations to the menus, the theming stayed on point. It’s time to talk fashion. The groom (or in this case model) wore blue pants and a white shirt… very Prince Eric. His bow tie, however, was a green and blue swirly pattern which was a throwback to the ocean from which his new bride came. He was casual and easy going. Refreshing. The bride wore a fabulous, sheer, layered dress that was dip dyed with a sea foam color… almost as if she had been walking through the water. It was stunning and not an obvious choice for a wedding gown. 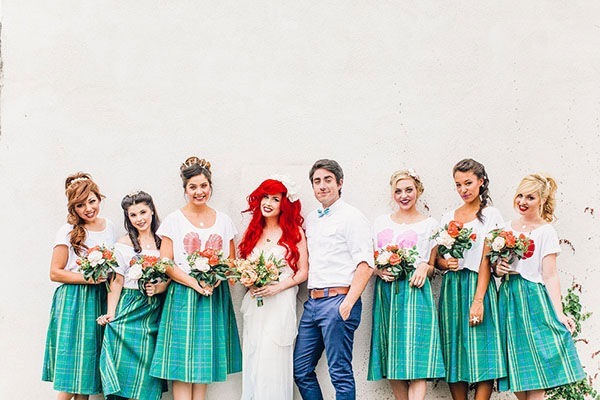 Her bridesmaids wore even less obvious choices with circle skirts resembling seaweed and tee shirts with seashells on them Shell accessories finished off the look. 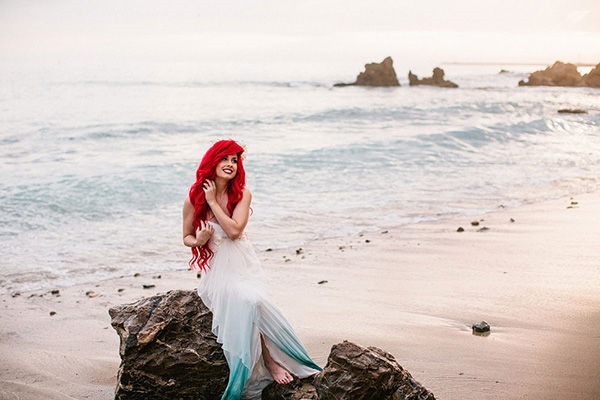 Very beachy and casual yet a complete throwback to the Little Mermaid. There are many more pictures on Disney Style Blog as well as on abc7’s news story. 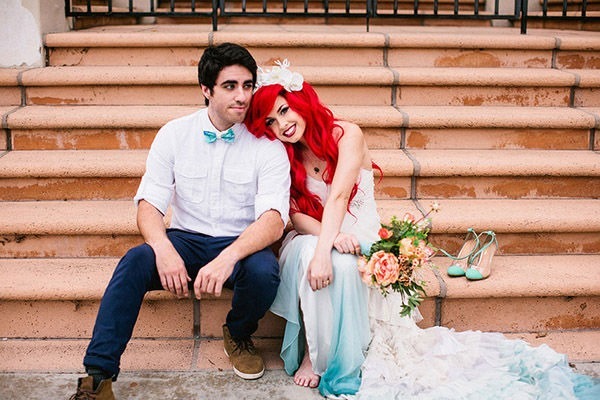 Check it out for more great pics of this Little Mermaid themed mock-wedding. Would you have a themed wedding? Let me know what you think in the comment section below.